I love cinnamon raisin breads. I make them often and find them to be the perfect breakfast treat, with just enough sweetness to not require jam, just enough fruit to constitute more than just carbs for breakfast. 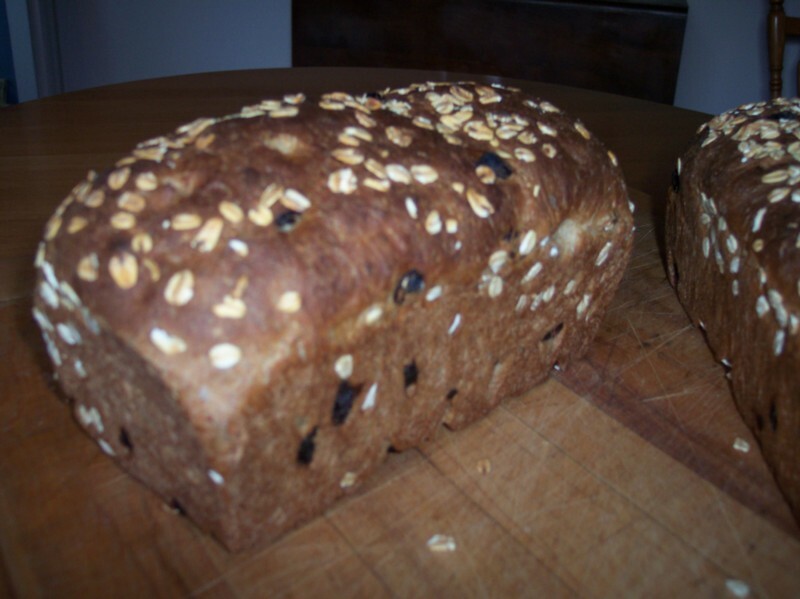 I've baked many different raisin bread recipes. Some I find to be too sweet, others too heavy on the whole wheat (though white flour alone I don't find that satisfying either). 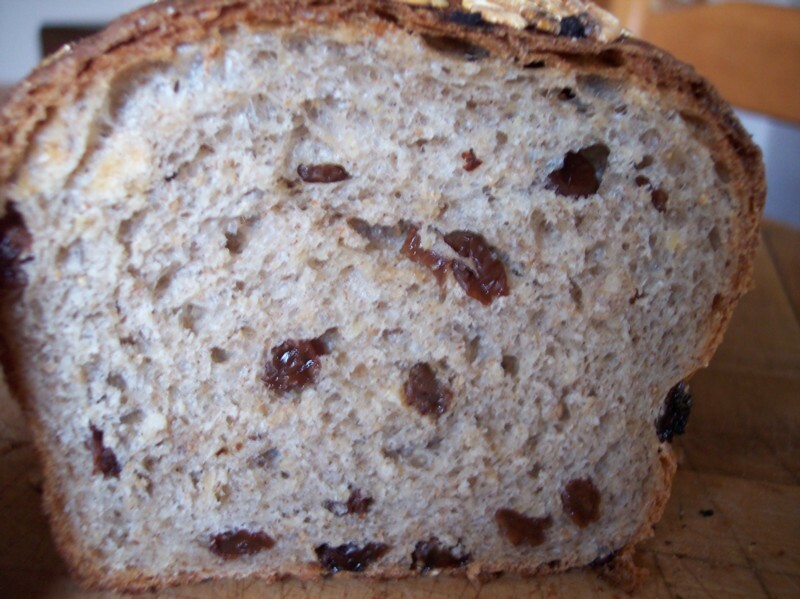 This recipe, from Jeffrey Hamelman's Bread, is one of the best raisin breads I have found: I particularly enjoy how the oats on top of the loaf toast up nicely. One interesting thing Hamelman mentions in a side note is that chemical compounds in bark-based spices such as cinnamon and nutmeg inhibit yeast activity, so more yeast than typical is required. This is a good thing to keep in mind when adapting a normal bread into a cinnamon raisin bread, something I do often. And a warning: this recipe makes three substantial loaves. It pushed the capacity of the standmixer. You may want to consider halving the quantities. 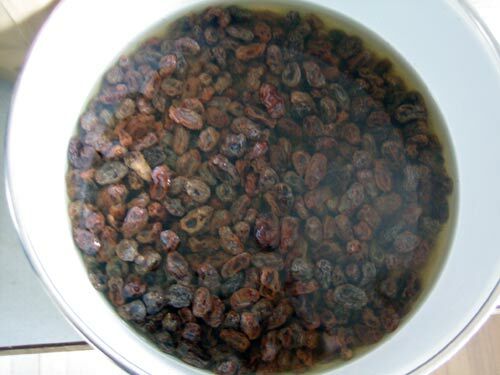 At least half an hour before you begin, soak the raisins in warm water. Doing so plumps them, which makes them softer and moister in the loaf and also prevents the ones on the surface of the loaf from burning. 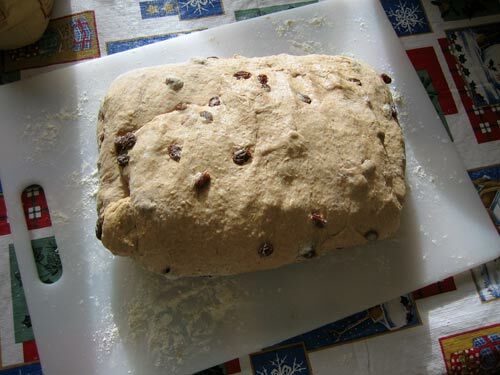 Just prior to adding the raisins to the loaf, you'll pour the water out. 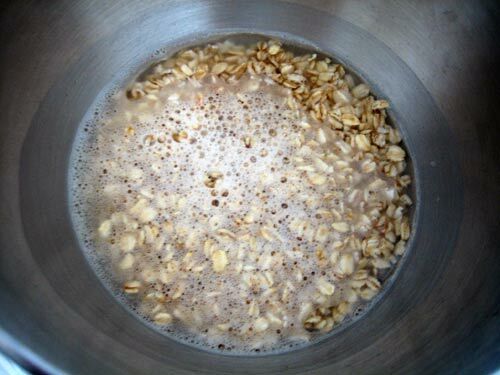 Next, soak the oats in the 2 1/2 cups water for 20 to 30 minutes. If you are using active dry yeast instead of instant yeast, which I did, withhold 1/2 cup of the water to proof the yeast in. Mix the flours, yeast, milk, honey, oil, salt, and cinnamon into the oats. Mix well, until all of the flour is hydrated. 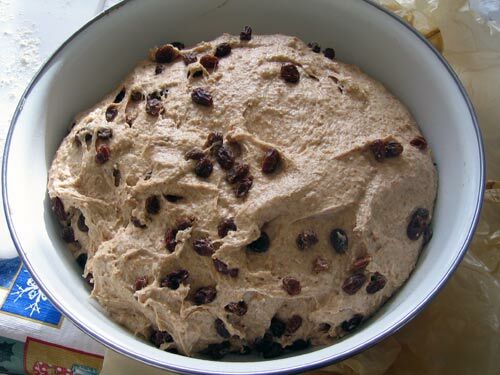 Knead by hand for 5 minutes or in a standmixer for 3, then mix in the drained raisins. 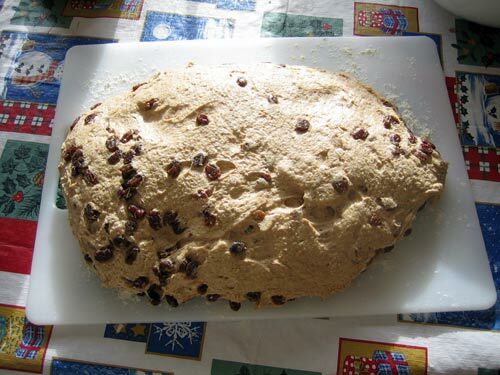 Knead or mix until the raisins are distributed throughout the dough. Cover the bowl of dough and allow it to rise for 1 hour. Then remove the dough from the bowl and fold it, degassing it gently as you do. The images below illustrate this technique. Place the dough on a floured work surface, top side down. Fold the dough in thirds, like a letter, gently degassing as you do. Fold in thirds again the other way. Flip the dough over, dust off as much of the raw flour as you can, and place it back into the bowl. Cover the bowl and allow the dough to rise in bulk again for another hour. Then divide the dough in thirds and shape the loaves. 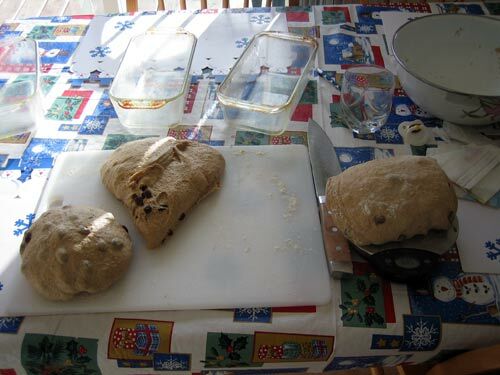 Place each shaped loaf into a greased bread pan. 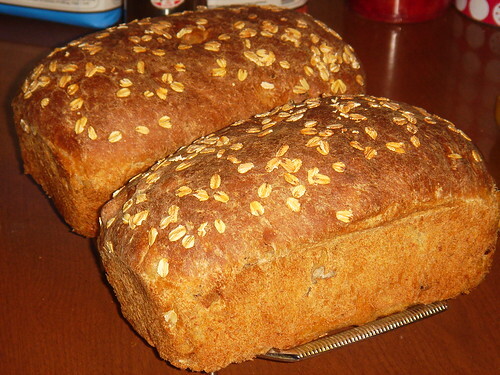 Spray or gently brush each loaf with water and sprinkle with some more oats. Cover the pans and set aside to rise until the loaves crest above the edge of the pans, roughly 90 minutes. Preheat the oven to 450. Place the loaves in the center rack of the oven. After 5 minutes, reduce the oven temperature to 375. Rotate the loaves 180 degrees after 20 minutes, and bake for another 15 to 25 minutes, until the tops of the loaves are nicely browned, the bottoms of the loaves make a hollow sound when tapped, and the internal temperature of the loaf registers above 185 degrees when measured with an instant read thermometer. Yeah, ok, you are supposed to let the loaves cool before slicing. I couldn't though, and I have no regrets! 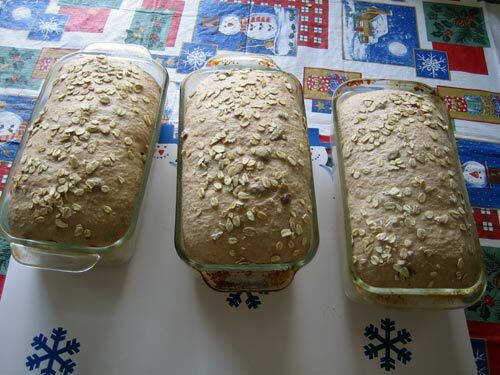 Related Recipes: Sweet Corn Raisin Bread, Maple Oatmeal Bread, Struan Bread. but I used cinnamon and nutmeg in a dough for an apfelkuchen on Christmas and didn't have any problems with the rise. I used approx. 1 tsp. of cinnamon and 1/4 tsp. of nutmeg to 2 1/2 C. flour and 1 tsp. yeast. perhaps it is different in larger batches? any differences in the dough. I would make this tomorrow if I didn't have a run planned, but I couldn't make it even if I didn't because I don't know what pan size to use. Is is 9x5 or 8x4? I have 8 1/2 by 4 1/2 Pyrex pans. But I don't see why not knowing that should prevent you from baking this. If you have 9 x 5, you could give it 5 minutes more, 8 x 4, 5 minutes less. But the difference in elevation between us, the differences in ambient temperature or humidity, the quality of our ovens (mine stinks) or baking in metal versus Pyrex is likely to offset any slight difference in pan size. So even if we have the exact same gear I'd caution you to use your own judgement. I don't know why I couldn't, but for some reason I don't like baking bread unless I know the pan size. It may sound crazy and I would have to agree, because after thinking about it, it is. One reason is that I only have two 8x4, but I have 9x5, so since it makes three, I needed to know. Also, is the pan size you use for loaf bread usually 8x4? As I mentioned, my baking pans are 8 1/2 x 4 1/2 Pyrex pans. You can see them in the photos above. Nothing fancy, just what they happened to have at the grocery store the first time I wanted to bake bread at home 10 years ago or so. Floydm all I can find is white oats is this the same as rolled oats u have used, if not can I simply replace these by all purpose flour in the recipe. I've made this bread twice per the recipe and it is excellent. Last week I made it again, but I substituted "Bob's Red Mill Old Country Style Muesli" for the oats and it is even better because of the little crunchies in the Muesli. Next time, I plan to increase the Muesli by about 50% and add some crushed walnuts. 90% of the fun of baking and cooking is winging it! The last two times I have made this, I get a terrific rise after the folding step, but I get very little rise when the loaves are in the pan, and it comes out much denser than Floyd's picture. Any suggestions or comments? Would a second folding before cutting into 3 pieces be appropriate? I'm making this bread right now, and I just hit me, do you soak the raisins then measure, I'm measuring by weight, or measure then soak? I know it doesn't matter that much being that they're just raisins, and I measured then soaked figuring I would be adding more raisins which I would prefer. But I was just wondering if there is a standard method here. The more I think about it if the recipe calls for x amount of soaked/drained raisins the you should soak them first then measure. I just started baking bread. This is my very first bread that I baked and it turned out perfect... I love it! Thanks for posting the recipe. I am wondering if you can also post a recipe of a 100% whole wheat bread. Thanks! My husband couldn't resist- he have to taste it right after I pull it out from the oven...yum Bread!! Last time I made cinnamon raisin bread, I used the recipe in the BBA, posted here. I made it with the swirl inside, and it didn't spring in the oven at all. This time, I used Floyd's recipe (above), and experimented by making one loaf with a swirl and one without. I wanted to see if either method resulted in more squished loaves, as happened with the BBA recipe. Here they are. In both photos, the swirled loaf is on the right, though it's hardly visible in the crumb shot. This is not what I expected! I thought the extra handling of the dough to flatten it, then roll it up with the cinnamon sugar inside would take away from the rising, as Floyd suggested in a comment on the BBA version I made earlier. Big whoop, it still tastes great! I like this version better than Reinhart's. Thanks so much for posting this recipe. I tried it over the weekend and it was a hit with the family and the neighbors. I just did this quick calculation using excel. Thought I'd post it here and maybe save someone a minute. 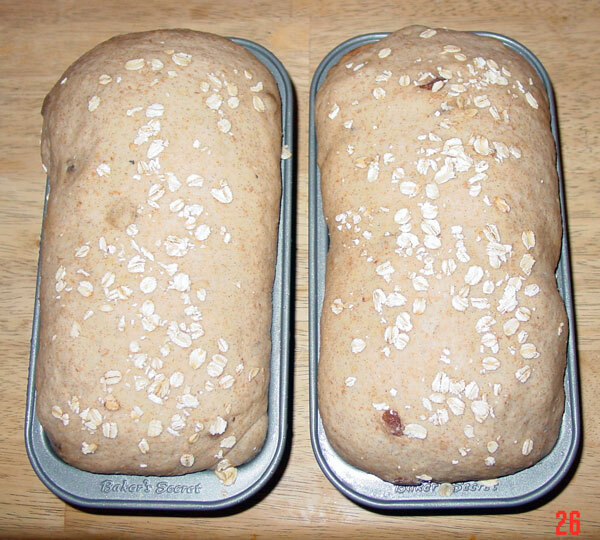 Floyd's original recipe above is about right for two larger loaves in 9 x 5 pans. I did a conversion to grams myself, before I saw this, though of course altering the quantities up or down a gram to round things out. In fact it looks like a recipe that was originally developed in grams, the one we have here being so packed with awkward fractions of ounces and slivers of cups. I tried this recipe earlier this week and it is delicious! The only changes I made: I used golden raisins, upped the honey to 4 TB instead of 3, and forgot to put the oatmeal on the top, so I brushed the tops with honey while they were still hot. One thing....I could not get all the white flour into the dough. I only used about 4.5 cups instead of 5.5. But the bread rose nicely and was not too wet when kneading it. No sad streaks, great taste and texture. It is fantastic as toast - very crunchy and yummy warm with honey drizzled on. I think this will be a regular around here. 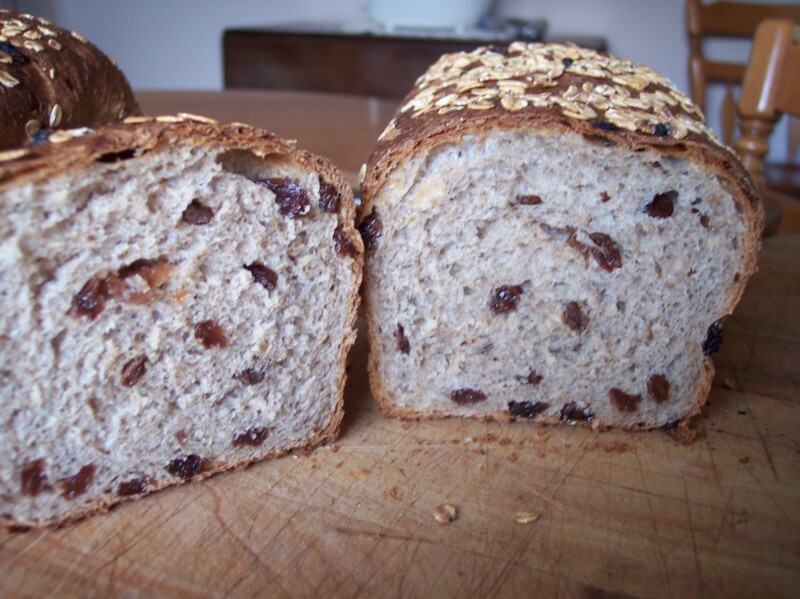 My husband liked it so much he said it would make a great bread even without the cinnamon and raisins - high praise from a white bread man! Bread turns out great ... yummy! But I reckon it's dense and on the heavy side. I ran out of time today so I cut the final rising time from 90min to 60min. Could this be the problem? Made half the recipe. Used golden raisins and chopped dried pineapple. Instead of the whole wheat called for in the recipe I used a 1:1 combination of durum flour and white whole wheat. Added 2 tblsps of sourdough starter for flavor. The dough turned out very wet coz of the starter so I had to add atleast 1.5 cups of additional flour but I still kept it on the wet side. Kneaded for 5 mins and the dough came to together into a smooth elastic ball. The resultant dough was one of the most perfect I have ever made. Soft, supple, very good gluten formation. I only did 2 rises: one long rise followed by shaping and then the final rise in the pans. The final rise only took 30 mins. The dough yielded 2, 8x5 loaves weighing 1lb 10oz each before baking. Baked at 400F for 30 mins. The oven spring was phenomenal. The crust was crisp and the crumb was super soft, silky and open with a slight chewiness. The cinnamon flavor was a bit weak because of the extra flour I had to add but still discernible. The starter gave the bread a slight tang. Will post pictures later. I used T65 and T150 but about 5/8 of a cup never made it in to the dough. I didn't put all the flour in and then added just a little bit because I find the proportions in american recipes always have to be played with. Just mentioning that in case any other europeans want to try this bread. The bread came out really well and was a very big hit. Toasted, it is exceptional. I like the idea of making mini frosted buns that I saw up there. This looks like really good bread! I must say that when I got the Hamelman out of the library, I wasn't that wild about it. (It really isn't a book for the home baker at all.) I read the first chapter or so before giving up; I didn't manage to go so far as to even think of trying any of the recipes. Thanks for posting this one. I think we neeeeeeeeed to try it. First, I sympathize with your first attempt at this bread; the same thing happened to me but, like you, I thought it tasted so good I'd better give it another try. It's now a staple for breakfast in my house. Mornings just shouldn't begin without it! I think the problem is with over proofing in the final proof. I went just a bit shorter the next time and all was well. This recipe also works well with spelt, and I've upped the whole grain content considerably over time, to no ill effect. About hand grinding; that's what I do, and I've had the best results with soaking the flour before using it. My mill makes a pretty coarse flour, even after 3 passes through, but I find that a good long soak (overnight is great, but a couple of hours helps too) takes care of any problems with heavy bread. Improves the taste 100% as well! If you haven't seen it, Peter Reinhart's Whole Grain Baking is a huge help in this regard. I don't recall that he addresses coarse flour specifically, but that's what I've used to make all his recipes, and it's worked wonderfully! Cinnamon Raisin Oatmeal Bread from Hamelman's "Bread"
The Cinnamon Raisin Walnut Bread from BBA has been one of my favorite non-sourdough breads for several years. 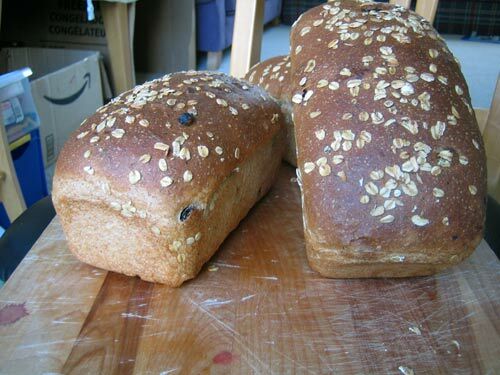 I finally got around to making the Cinnamon Raisin Oatmeal Bread from Hamelman's "Bread" today. Most seem to have made 3 loaves from this recipe, and, although that's what Hamelman says one recipe makes, he also says to scale it to 18 oz for 1 lb bread pans. One recipe made 4 - 17+ oz loaves for me. I did the optional overnight retardation. After forming the loaves, they took 3-1/2 hours to fully proof. (They never really crested the pans.). I got good oven spring, but the loaves do have a lower profile than the heavier ones pictured above. I baked at 450F for 15 minutes before turning down the oven to 425F. The loaves got really dark, as Hamelman warns they can. Next time, I'll do as Floyd did and turn down the oven after 5 minutes. In contrast to Reinhart's raisin bread which I'd definitely classify as a "sweet bread," Hamelman's is more substantial due to the WW content. 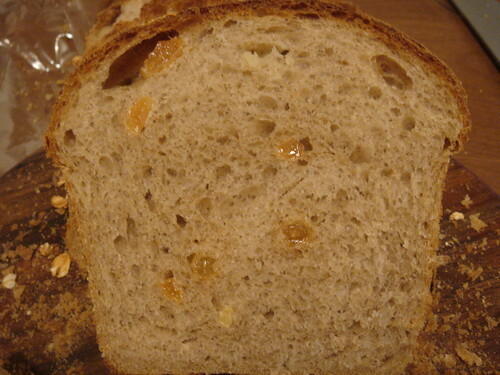 But, in spite of how it might appear, the crumb has a very light, tender chew. Quite lovely. Oh! I also substituted a smidgen of whole rye for a little of the high-gluten flour. I'm looking forward to having it toasted for breakfast. Those are quite delicious looking David. 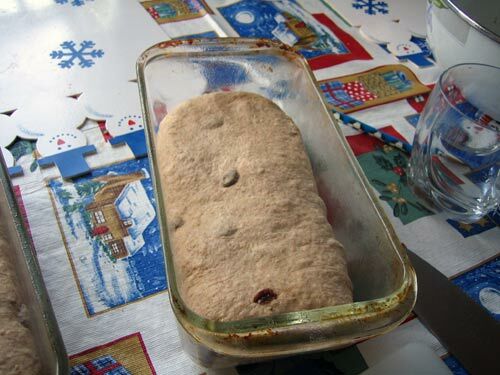 I've been pondering what to make for a holiday gift bread this year. Maybe that would be a good choice. I'm just a little leary of the rise stalling and having it become dense. I just took a look at the recipe and I see he gives an alternate application of the spice. Have you ever done that process? It does look like a tempting bread. Nice job. You have me thinking. I've not made this bread before, so I havn't tried the alternative cinnamon application - making a swirl. That's what I do with the BBA bread. I think you would probably get more of a cinnamon-sugar "hit" with the swirling method. Next time I make this, I will probably try the roll-up/swirl alternative and also add walnuts. The bread doesn't have a super-sweet flavor. The main effect of the sugar to to really crisp the crust when you toast it. As a holiday gift bread, it is certainly good, but it's not a first choice if your recipients are sugar junkies. As far as the "rise stalling" goes, I don't know how much was because of the cinnamon zapping the yeast (which shouldn't happen with the swirl method) or the cold retardation. In either case, just proofing longer worked for me. The bread certainly is not "dense." That would be a good trade. The seal is still on the box where I put it last night hoping to keep the mischief to a minimum. No real sugar junkies in the bunch so this might be a winner. Just a quick question that I think I know the answer to but, did you do the overnight retard at room temperature? Not to be picky but yours look a little like they might have been over proofed or maybe fermented. They don't seem tight. I like the idea of the longer ferment but I was thinking of retarding them. What do you think about that? You may know the answer, but I'm not sure about the question. How would "over night retard at room temperature" not be oxymoronic? The dough was retarded in the fridge over night. I don't think the loaves were overproofed. Slightly underproofed, if anything. Is it possible my IQ is degrading as I continue to put dough in the cooler? Is what you have, Elizabeth. I'm afraid I can't help you without being able to taste your red pepper pate on each of the breads you list. Please understand that, for you, I am willing to undertake this assessment. This is very noble of you, David. Do let me know which you think works best. is it right that ill gonna make it rise twice? i'll gonna try it tomorrow. thanks. It works with just one rise too, but do it on the counter rather than in a warm oven. It's pretty forgiving bread (read about what I did when I made this cinnamon raisin oatmeal bread the first time before I had a digital scale...). thank you for this wonderful recipe.i made it today but i cut the amount of cinnamon in half but its still delicious. I've got a batch of this doing it's bulk ferment right now. I used half KA bread flour and half KA white whole wheat, added some more milk to adjust for the extra ww, and subbed walnuts for the raisins. (Because raisins are the bane of my foodie existence. I hate them with a passion. LOL) I'll post how it went later. You made me a hero! We had a sleep-over for the kids last night. I made your recipe late at night and we ate it for breakfast this morning. Ok, I lied. Us parents devoured one loaf while it was still sticky-warm and squishy. The other we ate for breakfast :) Even the picky kids ate it. I really loved the way it was soft and chewy through and through, but it crisped up really well when toasted. I'm now a hero among the 2-9 yrs crowd. Thanks. And it is still the best bread I make. I've made it several times now and it never fails me. I bake mine in 2- 4 1/2 by 12 bread pans because I didn't have 3 pans alike and I am obsessive about matching pans. I need to work on that. So I bake 2 pans, cool, cut in half, wrap well and freeze 3 of them. That way we don't eat it all in a few days. I can thaw half a loaf and it lasts a few days. We love it toasted with a bit of honey or peanut butter. The best! How high can you push the oatmeal? 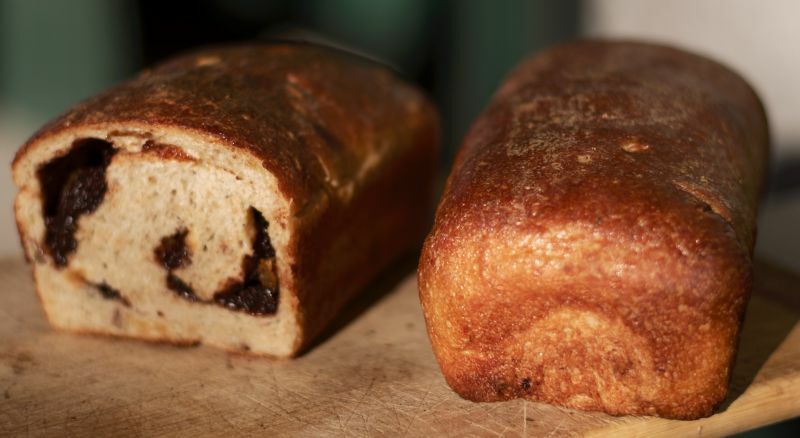 I've made this bread (fantastic, especially if one adds some diced pecans). Any idea how much one can bump up the oatmeal (great for lowering cholersterol) while mainting the taste? Is addition of oatmeal best done by reducing wheat or hi-glut flour? re: How high can you push the oatmeal? Because oatmeal has zero glutens, I would be inclined to keep the high gluten flour at the same level and replace the regular flour with the oatmeal. Or perhaps reduce both kinds of flour and add a some vital wheat gluten. P.S. Good idea to add diced pecans! Do you put dry or soaked oats on top? I'm guessing dry. Thanks! My only mistake was making just half the recipe, as this is REALLY TASTY! I approximated and didn't drain the raisins as thoroughly as I should have and was surprised at how well the loaves came out. This recipe appears to be foolproof. Next week I'm going to substitute pecan bits for the oat topping because my son requested it. Thanks! I have made this twice...luckily i bought a dough hook that has a wide flat piece at the top and it kept the "blob" from overtaking the KA mixer (fondly referred to as the cement mixer...almost met it's match here though!). I will probably do two loaves the next time as I am spoiling the people at work. I had no problems with the recipe or the rise...great!!! Thumbing through Jeffrey Hamelman's book this morning I was looking for a bread I could make for my sister in law . She loves to browse the local rummage and garage sales , coming up with some great deals from time to time. Her latest find was an unused 14x16 oven stone. Thinking of me she forked over the entire $3.00 they were asking for it, knowing that I'd been looking to create a little more baking real estate in my oven. I've priced these locally and on the net and the best price I've been able to find is in the $55-60 range, so for 3 bucks the least I could do was tell her I'd make a few loafs of bread for her over the coming few weeks in appreciation of her thoughtfulness. When I asked what she'd like me to make she said "surprise me, but please, nothing sour" . I decided on Hamelman's Cinnamon Oatmeal Raisin bread thinking it would be something she'd enjoy with her coffee in the morning. As usual with Jeffrey's formulas, this one came together nicely, my only regret is not getting it in the oven sooner. Although it got a decent spring , I know that had I put it in even 10 minutes earlier I would have had a higher, tighter loaf. Regardless, it baked off fairly well, has a good crust and a soft crumb typical of a semi rich dough. I wondered a bit about the percentage of cinnamon as I was scaling it, thinking it seemed a bit much but it's a perfect balance for the other components and the overall flavour of the bread. I'm just glad I made a large enough mix to make a loaf for my sister in law and myself. This is easily the the best raisin bread I've ever tasted . Agreed - large amount of dough! It's funny, I made this bread just this last week too; is it the coming fall weather and everyone wants a cozy bread for making toast and drinking tea or coffee? Though I haven't been blogging much I've still been baking all along for my family's daily needs. 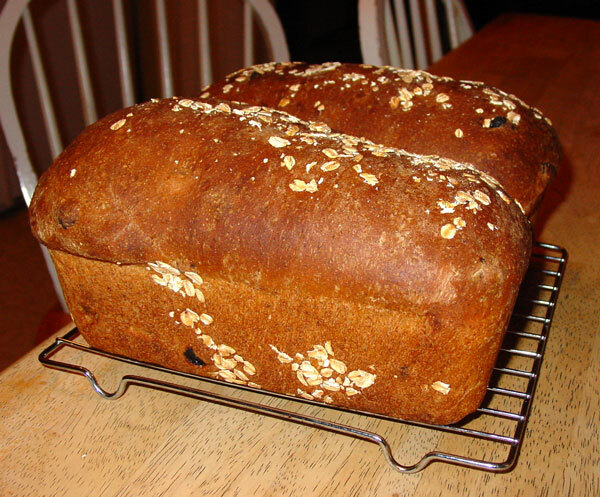 The last recipe I tried was from Hamelman's Bread book called Oatmeal Bread with Cinnamon and Raisins, on page 236. It's great - the overall cinnamon taste is what makes it wonderful, especially for toast. I followed the recipe fairly well with my usual two-thirds amount. The only substitution was for the water ingredient, I used part drained water from the soaked raisins. Hate to waste all that flavorful water. Also, I added cinnamon sugar when shaping the loaf to form a small swirl, just a little bit to get a little more sweetness in there. My dough made two loaves, about 24 ounces each. The recipe said to put that amount in a 9x5 pan, and I did this for one of the loaves but the other I put in an 8x4 loaf pan. The amount of dough seemed too small for a 9x5 pan. All in all, they both rose and baked well, dark crusts as Hamelman said they would and both seemed to fit the pans. Next time I think I'll just use the 8x4 pans and . . . not forget to put the oatmeal on top. Made this yesterday and it came out marvellously. I found that I did need more liquid, so I used some of the raisin water. Also I worked in the raisins by kneading them in. I also used one tablespoon of Chinese Cinnamon and one of Ceylonese Cinnamon which gave it a nice flavor. I think I might add some more cinnamon to it the next time to try to compensate for the lack of any other sweetener in the bread. I had a go at this recipe yesterday. I thought the recipe sounded good, especially all the feed back. The raisin bread my wife buys has a cinnamon swirl in it so I thought I'd try that as well. I had a recipe from the Kitchen Aid mixer book and thats the method I used to put the cinnamon sugar into the loaf. 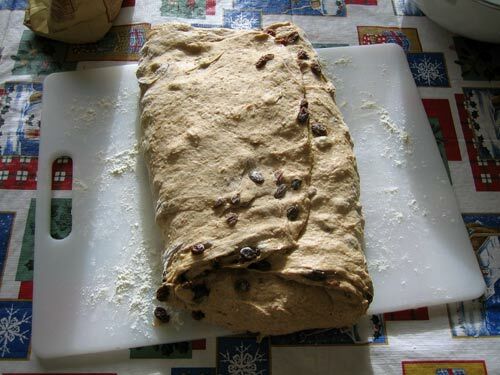 It says to spread soft butter then spread the sugar cinnamon mixture on the dough, then roll up the loaf. Before I even baked the loaf I was having some reservations about the butter, thinking it would make the dough come apart which you can see in the photo it did just that. Does anyone know how to do it without having the separation like in my photo? I was thinking next time just put the sugar mixture on without the butter. One of you people will know I'm sure. Any feed back is appreciated. By the way... I used "KipperCat" calculations for two loaves and it worked out great... thanks for converting the recipe over to gram measurements. 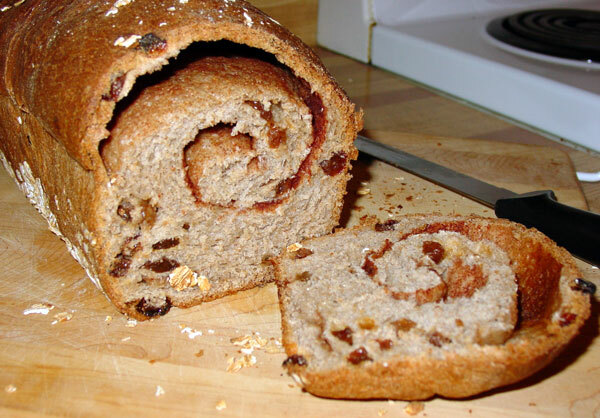 BBA there is a cinnamon raisin loaf that is similar to this that I have made many times. His method suggests flattening or rolling out the dough, then sprinkling the sugar cinnamon mixture without spreading butter on the dough first. I have never had a separation problem using this technique. I have seen the butter first method suggested by other bakers but have never tried it. Some of them might have had better luck than you did. You might want to omit the butter next time. If you have the same problem you might want to try a tighter shaping technique. Funny you should mention "tighter shaping". I actually rolled out the dough to approx. 14" x 9" rectangle before I applied the butter. I was concerned that rolling it out might cause a problem as well, but to my pleasant surprise the dough rose in the pans beautifully. When I put the bread in the oven for baking I mentioned to my wife about the possibility of the separation, thinking that the dough doesn't stick in the bowl when its lightly oiled. The next time I will for sure omit the butter from the plan. Other than the obvious the bread sure tasted good!!! Wow , this was a good recipe. I only made a 1/3 batch (single loaf) and it was great. I am a beginning baker so tried to follow the directions to the letter. Got no rise out of a 1 loaf batch. Found Mini Oven's 1/4 cup milk rescue plan in time to save the bread. Looking at the original recipe, the amount of yeast is less than the amount of salt and cinnamon. Yup. Slow rise, low yeast is where it is at. At what stage would you retard? Overnight rise in the loaf pans (in the fridge), then bake out of the oven. Ive done this with other breads with great success but not sure about this one. This is a bread that I made with yeast, leftover oatmeal, milk, raisins, pecans, and the cinnamon smear from KA. It's delicious, rich and soft, and it's hard to stay away from for long. This bread has worked for so many people....HELP! I could scream! The flavor is amazing. The dough rose very well initially but after shaping rose just a little in the pans and then stalled and then there was no oven spring. The breads look NOTHING like the high loaves in the pictures above. Dense and small. This thread is so old I wonder if anyone is looking. To those who succeeded what could have gone wrong? What flour did you use? I used KA bread flour and KA white whole wheat flour.. Would the choice of flour be it? Why does the later proofing not work well? Lack of gluten formation? Yeast dying? Should I use more yeast and/or add VWG? Also does this bread, this big amount of dough, really need only five mins of kneading? The dough came together nicely in a few mins and was soft and smooth but to me it felt like it needed more kneading. I kneaded maybe 15 mins when it got springier. I have very little experience with whole wheat or oatmeal in bread. Could I have over-kneaded ? Any help would be way so appreciated. came out great, I use KA bread and wheat. I left the dough a little on the sticky side as I live in the high desert and have trouble to form loves. I suspect the cinnamon could be fault for rising discrepancies. Two reasons: 1) Cinnamon contains an fungicide, yeast is a fungus, too much cinnamon can hamper yeast or even kill it. 2) Cinnamon products vary. I was quite surprised to find what I thought to be just ground cinnamon cut with a little more than 50% sugar the last time I bought it. Half the container was sugar! 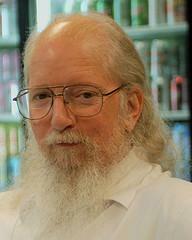 Only about 2% sugar occurs naturally. I quickly started comparing brands getting very irritated. Cinnamon comes from the soft underlying bark of a cinnamon tree and is wood, ground cinnamon is sawdust. It will not melt unless sugar has been added. If you happen to have tried this recipe and failed, it could be that the cinnamon was pure and not cut with sugar. Try heating your cinnamon and see if it melts. If it doesn't melt, use less spice in the dough recipe. Moisten or combine with some sugar to make a "swirl" in the loaf when shaping. (Pat out the dough flat and smear or sprinkle on the spice and roll tightly together.) See if that improves the rise. I made this today. While I was finishing weighing out all the dry ingredients, my 3yo came to "help". He knocked into the container of cinnamon causing it to fall on the floor and pop the top open which started a chain reaction that lead to a HUGE mess. He also knocked into a jar which fell onto the edge of the bowl that contained the soaking oatmeal then propelling it into the air and inevitably shattering on the kitchen floor. Ironically, this happened to be the last oatmeal I had in the house! Two hours later, after a trip to the store to replace the tragically lost oatmeal and retrieving the other 3 kids from school, I was able to continue making the dough. For the forst time in quite awhile, I had 2 fabulous proofings and OVEN SPRING!! My 10 yo exclaimed "Oh my gosh, what happend to it?" Wow, sounds like a lot of excitement in your kitchen! I made this one this weekend too, but it went much more routinely than it did for you. Good stuff, I agree, and incredible oven spring if you time it right. Wow! I love those kind of "all's well that ends well" stories. Of course, I don't envy you having to clean up the cinnamony mess but I do envy the oven spring. It's always so satisfying when that happens. Thank you for the nice recipe. This is my first participation and I am really happy with the results . I followed the 2 loaves ingredients according to KipperCat and they turned wonderful. However, they took a bit longer in the oven. I have been baking successfully from Hammelman’s Book, and this was on my list to try out. But I was a little reluctant due to the cinnamon reaction. So went through every post here and gathered some courage to go ahead and bake it. Will share the results. Hi. Looks like a great recipe. I've just converted it to grams, and intend to have a go. But about those raisins. I wonder why so often we soak raisins in water and throw the water away. Instead, I heat the raisins in a little water or brandy until the raisins are plump and the water/brandy is just about gone. Then I take them off the heat, toss them in a bowl, put a lid on the bowl and voilà: I get to keep all the raisin goodies. In this case, if you don't like my system, you could at least use the soaking water as part of the water in the recipe. This bread is so good!! I made it several times and I love eating it for breakfast with a thin layer of honey. I also make a "non-breakfast" version of it just omitting raisins and cinnamon so I can have it for lunch or dinner. Thank you for sharing! I've made several versions of cinnamon raisin bread, including the recipe in BBA and a sourdough hearth loaf with walnuts I'd thought that BBA was the best one, and it is, for a swirl type. Today I used the recipe in ounces, but also prefer to measure in grams. This recipe is delicious, quick, and easy. why throw out the raisin water? 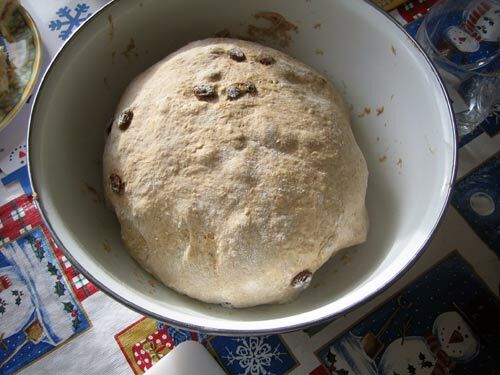 Looks like a lovely loaf (though I will cut the cinnamon by at least half -- not surprised it's interfering with the yeast at 1.3% of the flour weight), but why do you, like so many others, throw out the water you've soaked the raisins in? If we don't care about the gobs of flavor we're chucking out, we should consider at least all those anti-oxidants on the grape skins that are about to go down the drain. Stay your hands, folks, and use the raisin water to soak the oats in. Dreadful waste, otherwise. Thanks for sharing the recipe, though! This is a great recipe, tried it just a little while back. Gave loaves to each of my daughters and they enjoyed it toasted. So I am in the process of making this recipe for the first time right now. Doing my first rise but the dough smells AMAZING! I'll let you know how it turns out.